THE NATURAL HAVEN: African Threading : Rave!!! Have you heard of African threading? It involves wrapping thread around hair and is often used to create sculptural styles and originated in west Africa (a modern African version in the pic to the right). Some salons in the US are offering the same service actually as a heatless stretching method, the nwele technique ( fyi as a Swahili speaker that should be nywele meaning hair). Last week however as I was tweeting away I found a different version which seemed a lot more practical for those like me who prefer simple, quick styles. 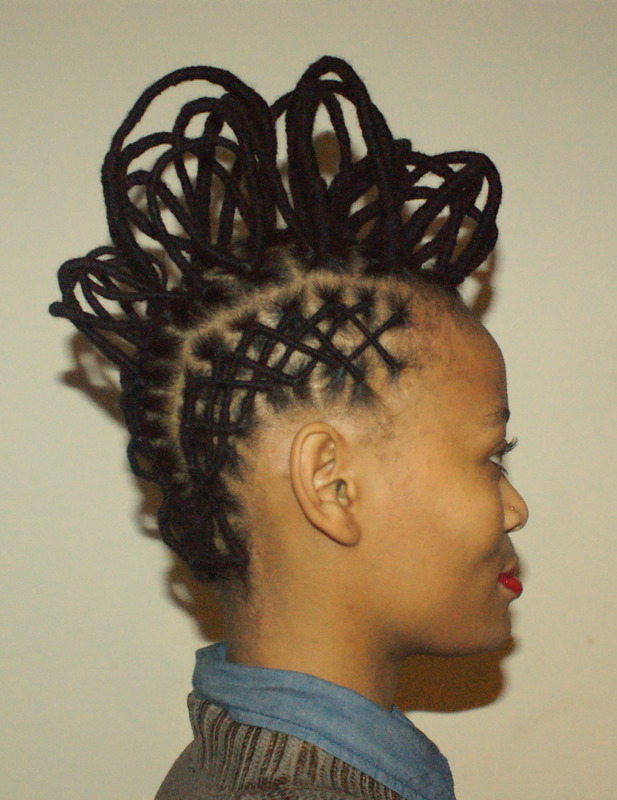 You do need some dexterity to be able to do the style on your own head. I have officially abandoned box braids until swim season when I will have to see how these hold up to regular swimming. I have been considering this technique for a while now and this tutorial definitely helped answer most questions, except one. 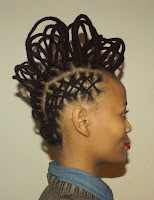 When doing loose braid african threading in the corkscrew style, how does one end the braid with out look extra fluff? I have just done mine in the corkscrew style. I do not knot the end, I just keep wrapping towards the end and change from the corkscrew to the more compact threading. I let the thread hang at the end and so far it has not unwound (one week, one wash). I always tuck my hair in so for me the little bit of hanging thread is fine because it gets tucked in. I think that it might be an issue if you intended to wear it as hanging twists. I love the modern version! I think the options are endless.Goapele incorporates this in some of the styles she wears, I think it's fresh, funky and can be edgy as well! African threading is beautiful. The photo looks like the thread style my Mom used to do on my hair. Oh, childhood memories. :o) I didn't like the style as a child, but I've come to appreciate it as I got older. I love Nadine's version with nicely spaced gaps. I like how much it looks like a twist. Yes, I've heard! I use to do it when i was younger. with rubber or thread. I prefer the thread because it's not shinny like the rubber and you can wrap the hair into different styles with it. The hairdresser had to add more thread at the ends to get the wrapped style because my hair was so short. Another African friend of mine just suggested i start threading my hair to get a stretched style, so she gave me some of her rubbers. I must say taking the thread out was so QUICK and kinda fun. and my hair was stretched! but i think i will be using a weave thread the next time, as i didn't like the smell the rubber left in my hair. Plus i can't rock it out, makes me look like a kid. Also, there are sooo many styles you can achieve with the threading method, so it's good for all ages. Also, Nadine inspired me to try out the method again, despite the fact that i don't see anyone (kid or adult) with threads in their hair in Canada or in China. Guess someone has to start the trend. Yea, Nadine's version is appealing because of the twist look. :o) Let us know how it lasts with regular swimming and all. I don't like how my hair looks like after unraveling the thread :( i look like sangoku, even if I fluff it out :o ! lol I had to google sangoku. I think that the threading does not impart a twist into the hair like twisting would so fluffing it out and going into an updo or puff might work better. It pains me to ask this as I am a big fan of threading. Wouldn't the thread create stress points along the length of hair if used as a regular style? I remember when I was younger, my African friend would have her hair threaded. Compared to doing a full head of medium sized twist, do you think it take the same amount of time? I have seen many tutorials but I have never attempted it, because I was afraid that the tension from the thread would cause damage to my strands. What would you say is the likelihood of that happening? Regarding damage - I have not seen people report damage from threading. I find that on my hair the thread is just compressing my hair. Damage to hair normally happens because of tension (pulling down motion) rather than compression (pressing together). The thread does not rub harshly against my hair and the tension applied during styling is mainly to the thread rather than to the hair. 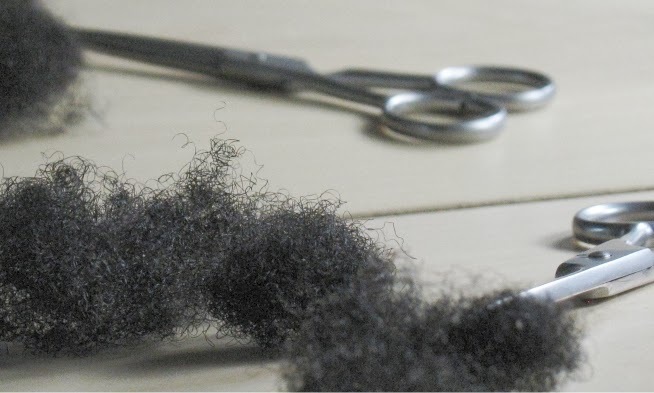 The part you have to be careful about is the beginning where the thread can pull at the root of hair if you do not place it in a good position. This is off topic but I didn't know where else to pose it: Recently, on Glamazini's blog, I discovered that length doesn't necessarily equal "hang time" such as in twist-outs and braid-outs. My eyes bogged out of my head at the thought. Then I realized that although I'm working with some swing-able length, my out-styles don't "swang." I am East African so this takes me back to my childhood when my mom would take me to get my hair threaded all the time. Absolutely beautiful! This type of plait looks complicated but it is surprisingly simple. I am looking forward to trying this in a twist style. I'm from Southern Africa (Zimbabwe, South Africa, Botswana region) and this is a style mothers do on children of school-going age. Here, nwele (not nywele) means "hair". I haven't had these done since I was a kid. I probably will get some side eyes if I did this style now in my late 20s, lol, but will try it anyway. I tried this method and love it! It's a nice way to stretch the hair without using heat and it does a really great job with stretching the ends of the hair which is the hardest part of the hair strand to stretch with heat (without going over it several times). Does anyone know a stylist/salon that does this in London UK?